Well yesterday we received a message saying that the flight we had booked to get there was no longer going to be a direct flight Richmond ---> Orlando, but rather Richmond ---> Boston ---> Orlando. Erm, sorry Beantown, but that's not very practical for our family! I called the Disney Travel Agents, and they immediately jumped on it to contact the airline, get us a refund, and find us a new direct flight. Not only that, but we somehow came out of it with a 5 hour extension of our vacation on the last day, and a $200 refund. Now that is customer service!!! Fall is the perfect time of year to get outside for some family fun! For the temperature sensitive like me, it's not too hot and not too cold, and God's magic makes this what a lot of people call the most beautiful time of the year. Here are some outside activities to try with your family in America's backyard! This is a wonderful activity for teaching your children the right sequence. For instance, the bird seed will not stick to the pine cone until you spread it with peanut butter! Why? What observations can they make? Spread peanut butter over the pine cone and roll in a shallow bowl or pan full of bird seed. There you have it! Tie a piece of yarn to your new birdfeeder and hang it from a branch in your yard. Your kids will love watching the birds come to eat from their feeder! Pack your jackets, water, and lunch and take the family on a scenic walk to see how nature is changing all around us during this incredible season. Paper lunch bags also make fantastic "treasure keepers." Let your child collect a few of the items they find in the great outdoors. Later go through them together and create an outdoor collage on paper with a little glue. Fall is a great time to play football. No doubt your little one has watched their share of football on TV with mom and dad, why not take them out for a family friendly game? The exercise and fresh air will make them giggle with delight as you tickle-tackle them. Have a favorite backyard activity not listed here? I'd love to hear from you! Please email me at hollyatnaptime@gmail.com. 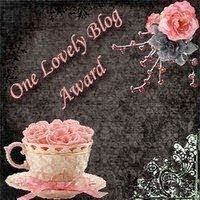 I recently received the One Lovely Blog Award from Oh So Savvy Mom. Thank you! 1. Accept the Award. Post it on your blog with the name of the person who sent it to you and the link to their blog. 2. Pay it forward. List at least 7 blogs that you have recently discovered. 3. Contact the blog owners and let them know they've been chosen. Hey Holly! Sorry I didn't notify you about the award. I had the post scheduled (I was on the road all day yesterday) and hadn't gotten a chance to get on the computer until just now =). Congrats! Keep up the great bloggin! Ahhh, thank you SO much for this SWEET award. I am sorry it took me so long to pick it up... It's been so hectic around our house. That is SO nice Holly. I am truly honored. I will post this up on my blog today. I appreciate you SO much. All of your comments and support keeps me going.